Lone Survivor is a compelling, easy read that you will find hard to put down. The first part takes you through SEAL training in Coronado, CA and gives you a deep appreciation for just how hard it is to become a SEAL, while the second half takes you through a harrowing battle that in many ways validates just why the SEAL selection and training process is so difficult and so effective. The battle sequence in Afghanistan and its aftermath is incredibly intense . The best screen writer in Hollywood couldn’t have dreamt up something more intense, moving, and awe inspiring. Reading this fills one with humility and gratitude for the sacrifice that all the members of our armed services make on our behalf, but especially for the men of the SEAL teams. All I can say is that I am very glad they are on our side. As an aside, if you enjoy books like this you should check out Bravo Two Zero by Andy McNab, an SAS operative who served in the first Iraq war. I found it highly ironic that in both cases great misfortune results from acts of human mercy that elite soldiers felt compelled to take despite the clear risk it posed to their own lives. These books should be required reading for anyone who questions the character and moral fiber of such brave men. 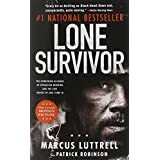 This entry was posted in Book Reviews and tagged Lone Survivor Book Review, Marcus Luttrell, Operation Redwing, Patrick Robinson, Seal Team 10 on November 5, 2014 by GunGuy.